Don’t Drop The Chandelier (June 11) in red, The Grrr Room in yellow (Aug 06), and descent route in blue. ¾ hour past access to Grasshopper, bush bash for 10 minutes to take long scree gut that reaches almost to valley floor, then easy height gain to 2200. See North Face of Steeple Peak. The col between Peak 2200 and Steeple is readily accessible from the mid South Temple valley. About grade 10 rock on the summit pyramid. Start in the notch at lowest point of buttress, climbing up a corner and out onto the face. Continue up and through some steep moves to near the ridgeline and on excellent rock towards the top. Easy descent towards Steeple peak. Protection and rock quality similar to Weta Prowl. 125 m height gain, Grade 14/15. Climb central gully. Crux 25 m high narrow water ice gut, up to 75 degrees and short thinly iced rock step. Overall grade 3. Just bellow west side of 2200m. Three pitches, first two thin, with tied off ice screws, a fat steep third pitch WI4, then onto upper snowfield. One abseil on descent down gully to right. Three pitches added to bottom later, one solo WI2, then two at WI 2+, and a thin WI3 to top of gully. The route is on the lower tier of the SW face of Peak 2200m, starting at around 1500 metres. Three pitches starting immediately to the left of The Grrr Room. Cimb left, then right to join The Grrr Room on the final pitch, then onto upper snowfield. 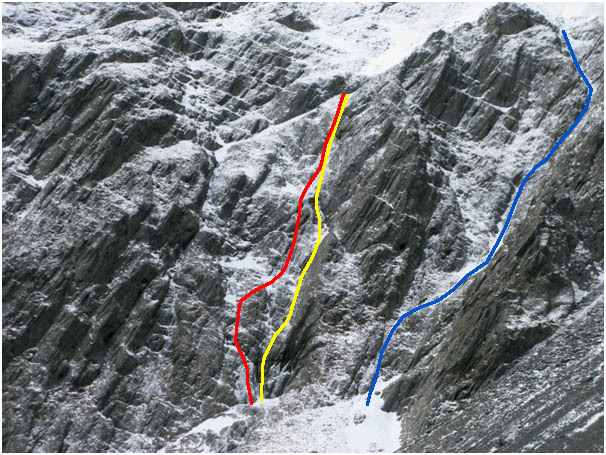 Descent down gully to right (marked in blue), may require multiple abseils depending on snow conditions.